If you've ever walked up a rainy mountain in the gathering dark, you were probably grateful for the classic pink and orange paper maps produced by Ordnance Survey (OS). Ordnance Survey has mapped every corner of our country, from Cornwall to Norfolk, from the Isle of Wight to the islands of Shetland. Ordnance Survey began in 1791, when its maps were used to help defend the British coast from the French. In the industrial revolution it surveyed and mapped land to build Britain’s railways. Today, of course, it produces the iconic paper maps. But that’s not all - these world-famous maps now make up only 5% of its revenue. The rest involves ‘big data’, producing super accurate geographic information that is used by the government and businesses across the UK. Ordnance Survey is a huge success in public ownership - but the government wants to introduce private sector capital into the organisation. Ordnance Survey is a national treasure that belongs to all of us, let's keep it that way. Wherever you are in Britain, however rural or remote, Ordnance Survey has mapped your location. It makes 2 million maps a year and records 10,000 geographic updates a day. They're not just paper maps either! Ordnance Survey has gone well and truly digital. Whenever you turn on a Sat Nav device or use an online search engine, you're making use of its digital map data, online route planning services and mobile apps. 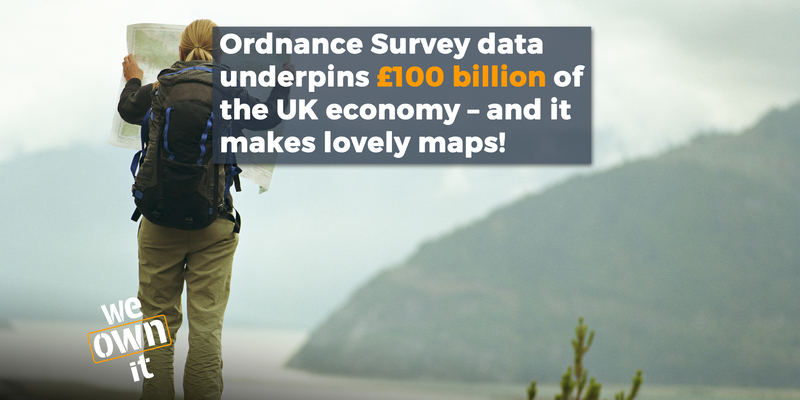 Ordnance Survey data underpins an estimated £100 billion of the UK economy and has saved the government tens of millions of pounds. In 2017-18 it paid £23 million to the public purse. Ordnance Survey data helps local government with flood risk prevention and grit provision, and makes delivery services and bin collections more efficient. Its data helps to locate people and save lives in emergencies like natural disasters and disease epidemics. It is used to help plan events like the London 2012 Olympics. Public service mapping agreements mean the government can use OS data for free (whereas private sector involvement could create pressure to charge for data). Is Ordnance Survey at risk of privatisation?